I came across a neat online resource that compiles a bunch of online games available for educators (Chang et al, 2009). Naturally I immediately started playing some of them, and I’ll share my findings here. 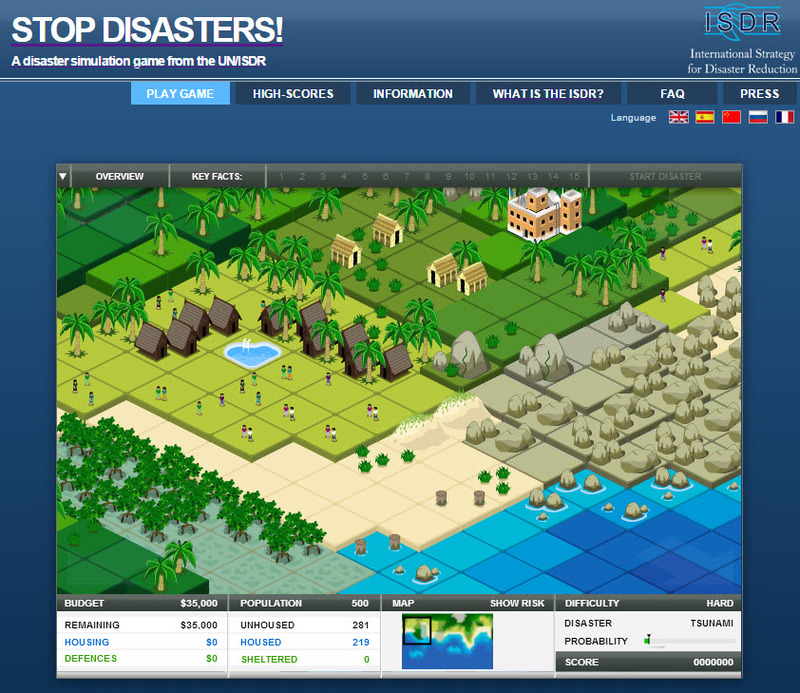 The first game is called ‘Stop Disasters’, available at www.stopdisastersgame.org. Its a simulation of different disasters, including hurricanes, tsunamis, floods, wildfires, and earthquakes. You act as the city planner for a particular area, and with a set budget have to decide how to prepare for a potential disaster while balancing other community needs (such as tourism or agriculture). 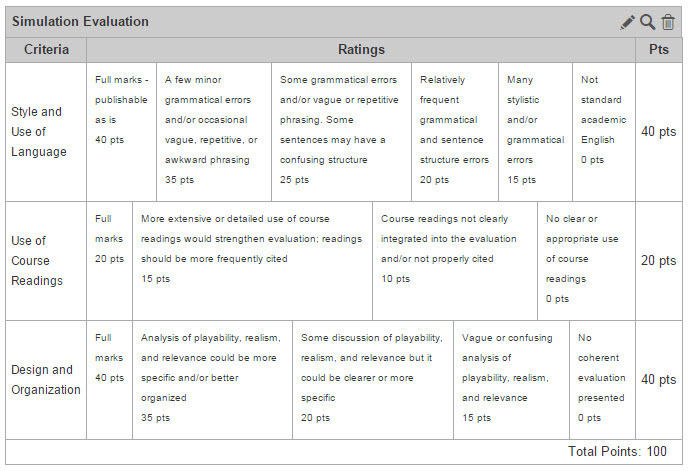 As you make decisions, helpful info boxes pop up to let you know how different measures make a difference. After twenty minutes, disaster strikes and you get a report on how well you met the objectives of the scenario, how many lives were lost, and whether or not you are fired from your position. You also get a score that can be compared with other players. The game is pretty fun. I played through the tsunami scenario and completely messed up the first time. I spent all my money on a seismic early warning sensor and other defenses, and not enough upgrading buildings with foundations and stilts or providing education on tsunami signs or clear evacuation procedures. Building on high ground helps a lot, too. The second time around was naturally easier, although 29 people still died, and I’m determined to play until everyone is saved. Other pros of the game are that it is very easy to learn with a clean interface, it only takes 20 minutes (less if you complete your defenses early and want the disaster to happen sooner), and its available in several languages (Spanish, French, German, and Madarin (i think) in addition to English). The downside is the problem that you know that in 20 minutes or so, disaster will strike. Thus you have a strong incentive to build defenses. Objectives such as ‘protecting livelihoods’ really mean ensuring that such buildings and businesses survive the disaster, rather than giving you a real choice in how you spend your money. The game would be more useful if players had to balance keeping the economy going with disaster preparation, without a 100% chance of the disaster occurring. Still, the game is fun and a useful way to start a discussion about why, if we know exactly what needs to be done to minimize losses during a disaster, these measures are not always taken. Then the 100% chance of disaster becomes a starting point for the conversation, rather than defeating the point of the exercise. This game could be used as a homework assignment in anticipation of a class on government responses to disasters, but it could also be used in-class. The easy way would be to take the students to an electronic classroom, but it could be done in a room with internet and projector. Simply choose your scenario ahead of time and write out their budget and the costs of all the different options on a handout. Put the game up on the projector, put them into small groups, and give them 15 minutes to make their decisions. Then insert the choices into the map, push the ‘start disaster’ button, and see what happens. You can do this pretty quickly with each group and see whose plan worked best, and then discuss why. I did a quick exercise with my intro IR class yesterday that reinforced a lesson on the meaning of politics and its distributive implications, showed them how decision rules matter, and served as a jumping off point for a discussion about Mueller’s arguments about the overblown nature of the terrorist threat. The exercise is very simple, and only takes about five-ten minutes. The magic genie of Governlandia has granted you one wish—a gift of 100 BILLION dollars. Good for you. Unfortunatley, this gift is somewhat restricted—you can only spend it on a handful of things, none of them for your own selfish gain. Scientists estimate that investing the entire $100 billion in any one area will completely solve that problem; anything less, and the problem will continue. However, you may distribute the money however you see fit. Groups did not know that there were two different prompts. When they had made their decision, they posted them on the board, and we discussed why they came to the conclusion they did. I used this to note a few things. First, no one gave any attention to the animal rights issues, which led to a discussion about the value of human v. animal life and how some issues can be seen as ‘luxury’ issues. Second, the method of decision making mattered: groups that were allowed to divy up money did so, but had a less intense discussion than those that had to choose only one policy area. All the groups prioritized health care issues, and we discussed the criteria they use to evaluate the use of funds. This led us to revisit the definition of politics as ‘who gets what, when, and how’ and segued into a discussion of Mueller’s work on whether or not terrorism is a threat and how people react to it. Basically this was a neat little 5 minute activity that took no time at all to whip up and explain, but generated numerous discussion points for the remainder of the class. If you try it out, let me know how it goes!